How do I know I have a cracked tooth? You may have a cracked tooth and not know it until it hurts. A crack may be asymptomatic for many years or may grow quickly. Cracks can occur from trauma such as a sports injury, biting on hard objects such as ice or a popcorn kernel, or extensive tooth decay. If a crack grows outwardly then a portion of tooth may break off. These teeth can be restored with a crown or an onlay. 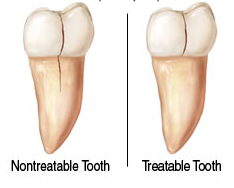 The missing portion of tooth is prepared and shaped then a porcelain restoration can be bonded onto the tooth. If the crack grows inwardly towards the nerve of the tooth then the nerve may become traumatized to the point of needing root canal treatment. After root canal treatment is completed then the center of the tooth is filled in with a core buildup material. The tooth is then held together with a crown. A crown covers the entire tooth and reinforces the tooth when its in function. If the crack grows all the way through the tooth root then it may be too late to save. These teeth have a poor prognosis and are usually extracted. Cracks are not always visible on an x-ray and are sometimes difficult to see in the mouth. If you have a tooth that hurts to chew on then its time to see your dentist. He may perform a bite stick test and vitality tests to see if the nerve of the tooth is affected. Its always best to treat a tooth before it hurts. See your dentist regularly and you may avoid losing a tooth due to cracks.